ACRoSS is an interdisciplinary forum for the presentation of summer research projects developed by students and faculty at Allegheny College. The series runs from mid-June to mid-August. At each weekly meeting, students present short overviews of their specific summer research projects (e.g., proposed experiments, data, anticipated results) to an audience of students, faculty, and administrators. 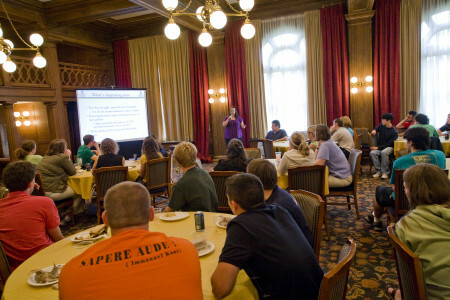 Meetings are generally held on Tuesdays from Noon until 1:30 PM in the Tippie Alumni Center’s Tillotson room. Lunch is provided courtesy of funds furnished by the Provost of the College and URSCA office. We have held the ACRoSS meetings since the summer of 2008.